You can train soldiers to be helpful in the battles at 8-Bit Armies. Each soldiers can handle a unique situation in the war. So, They should be trained enough to be successful. Remember that the soldiers aren’t the only fact to reach victory. You can use lots of things such as tanks and helicopters to kill the enemies. You can also choose to be defender or attackers with your powerful army. But most of the missions are based on defensive tactics at 8-Bit Armies. You can extend your lands by attacking the enemies. In that case, Your army can be much better by using these lands’ benefits. Players can collect lots of resources to grow up at this game. These resources can be used in lots of places. When you finish a battle, You will see some areas that have got damaged so hard. You need to repair the areas by your gained resourced. If you win a battle at this Strategy Simulation game, You will get extra resources too. All of the environments are designed by pixels. That’s why its name is 8-Bit armies. So, The graphics are simple. But the gameplay is really addicting for the fans of Strategy games. 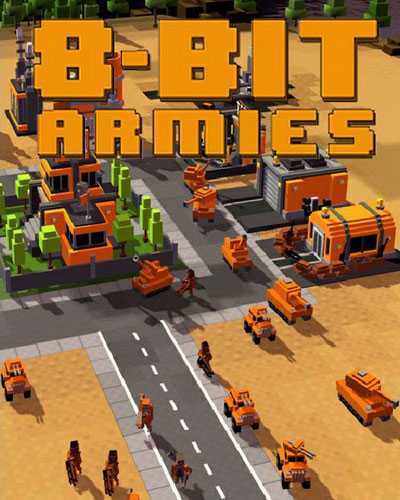 32 Comments ON " 8-Bit Armies Free Download "
Awesome, thank a lot for the free game version. P.S. Ali, please add games like “Bit Blaster”. Downloaded easily, Game wont open however unless steam is running… I open steam and the game still wont load and still gives the “Steam must be running” message. why does it said that I need a steam account to open the game? if so how can I connect it? sure ill add bit blaster!! Hey, I downloaded the game but it keeps saying log into Steam. How do I get around this problem? Hey, I downloaded this and every time I click to run. It says I need Steam running and logged in. How do I get around this? How Do You Even Get To The Main Directory. it keeps asking to modify WTF! wich fil do i open? The only thing that is actually opening up is 8 Bit Hordes which isn’t the one I want to play. Hey Ali please adda a word fo word manual on your pages. I opened it up fine but it’s not f***ing 8-bit armies it’s 8-bit hordes. WTF Ali! ?